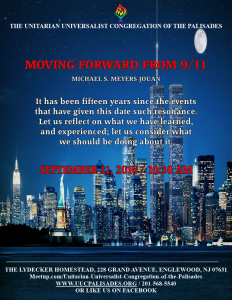 Please join us for today’s service led by UUCP member, Michael S. Meyers-Jouan. It has been fifteen years since the events that have given this date such resonance. Let us reflect on what we have learned, and experienced; let us consider what we should be doing about it.